The Sauber Mercedes C9 made quite a splash in 1989, winning the World Sports Car Prototype Championship with both the #61 and #62 racers. In this curbside kit you have the option of building either vehicle with the decals provided. 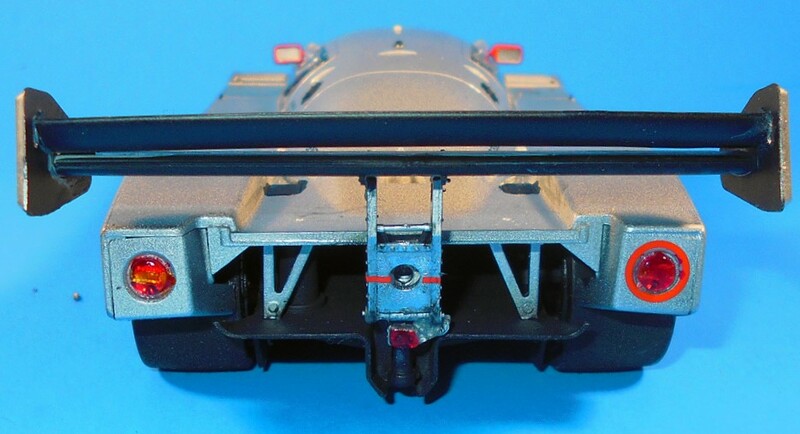 Although this is a simple model it is rated a skill level three kit for modelers aged 14 and over by the manufacturer due to the large decals involved in finishing. It has 79 pieces molded in gray, clear and black styrene. The decals are very nice with a great register and minimal carrier film. 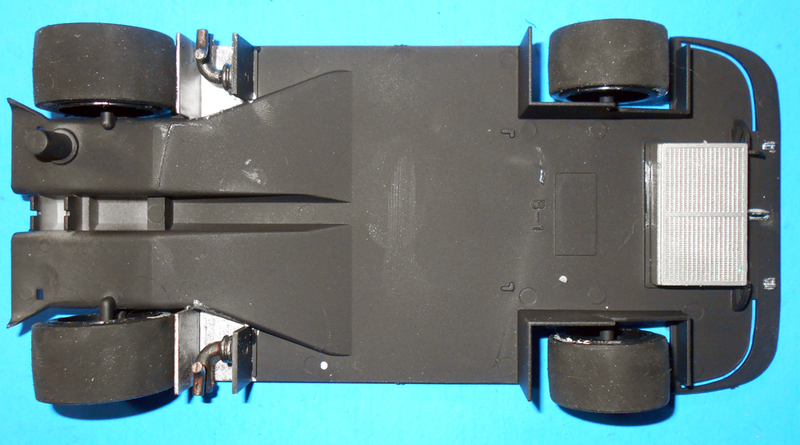 There are no drivetrain parts and the underside is a plain floorpan with a few molded in details. When finished the dimensions are approximately: Length: 8", Width: 3", Height: 2." The best way to describe the kit is to say; "wait for it!" By that I mean even though you don't fell like your putting as much together as traditional car kits with drivetrain parts, it turns out to be quite a great looking shelf display when you're finished. I started with the chassis pan by installing the rear A-arms and cylinder on the back and the front hinges, then painted it flat black. The exhaust wall is aluminum and black and the mufflers are just aluminum. I painted the exhaust tubes steel and added some rust tones for effect. Installing the exhaust to the chassis and the flat black radiator were straight-forward with no fit or assembly issues. The wheel rims had a great sheen and color so I left those as-is and painted the hubs aluminum and steel. I chose to build car #61 so I painted my brakes aluminum. I rouged up the tire tread area to remove the lateral mold line. Note that the front tires are smaller. 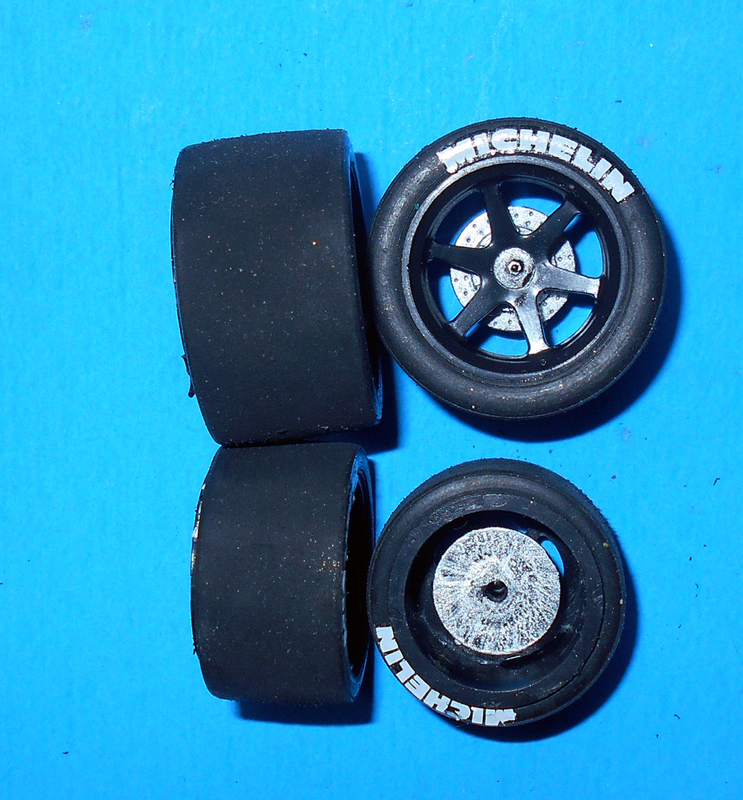 Assemble the wheels by inserting a rim into the tire and add a locking ring to the back. After assembly the "reverse" decals are applied to the tires by locating the script on a tire and wetting the backside before careful removal of the carrier film. Just slip the tires into place on the chassis' wheel spindles. The interior pan and seat are flat black and the cockpit area is aluminum. The driver seat is olive drab. Add the brake lever and at the rear and paint the light with some clear red and put it into place. Prep the body and add the external parts including the side panels and air dam. You'll need to drill the holes through for the mirrors, then give the body a good wet sanding. I painted the body with a simple silver and let it dry. There's a very good depiction of where the decals are placed in the instructions that are easy to follow. I used plenty of warm water and some setting solution to nudge them into position and used the red circle decal in the right rear taillight to identify it as the #61 car. After the decals had dried overnight I sprayed a clear coat to reduce the sheen like the factory finish and seal in the decals. 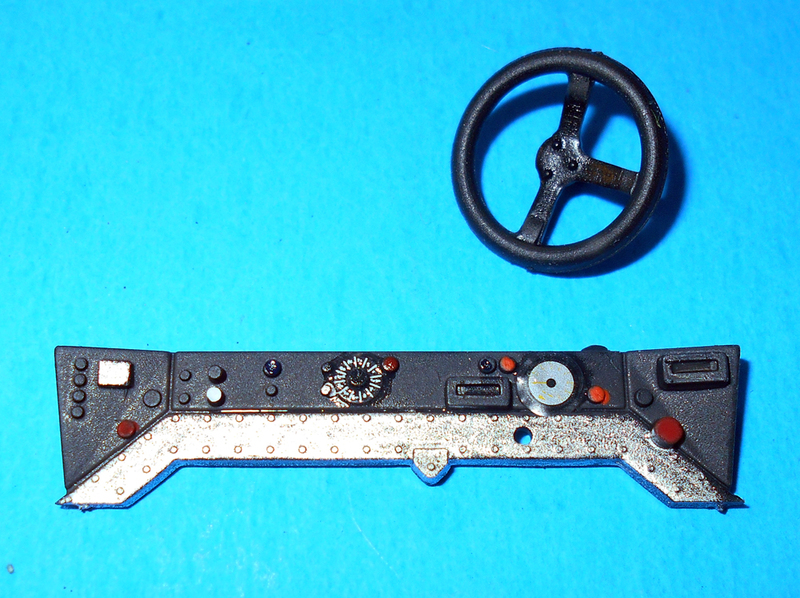 Paint and decal the dashboard and instruments then install the steering wheel and dash into the car. The window surrounds were detailed with a black Sharpie marker and installed with some clear glue. 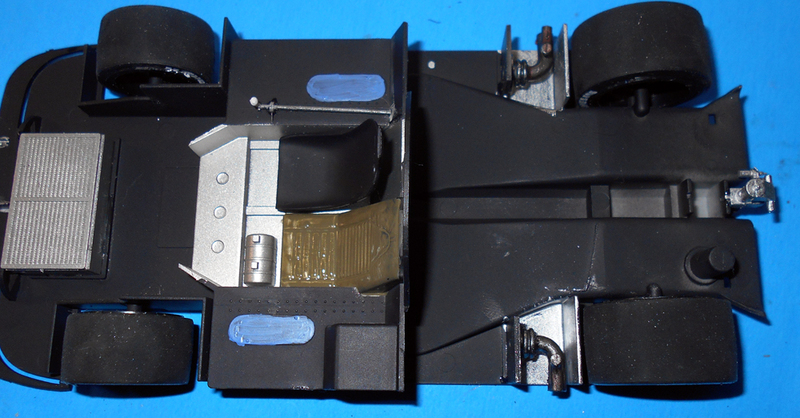 Assemble, paint and decal the rear wing and add the body brace to the chassis. Spread the body's sides slightly and drop the chassis into it to install. I only needed a drop of glue on the edges to lock the assembly together. Install the rear wing. The fit of all the parts was excellent. There really wasn't much to tell about the assembly of the kit. The parts all fit together precisely and there was no warpage with my sample. Gluing points were well engineered for the bosses and receivers to keep the parts together and still hide the joints if glue is used sparingly. Use a tape loop to install the window to keep from getting glue on it and outside installation makes it much easier. Hasegawa's version is a nicely rendered model of those successful racers. As a curbside kit it's all about the finish. If you take some time on that you can still complete this kit in a weekend to bust that builder's slump and put an excellent display on your shelf! Thanks goes out to Hobbico and IPMS/USA for letting me share this review with you!